This recipe was originally posted wayyyyy back in January of 2014. Before I had many followers or even a mailing list for subscribers. It was one of the very first recipes and it gained some traction on Pinterest before I was even ON Pinterest. Fast forward, this is still one of my go-to recipes and one I really love, so I thought I was share it with you again today. 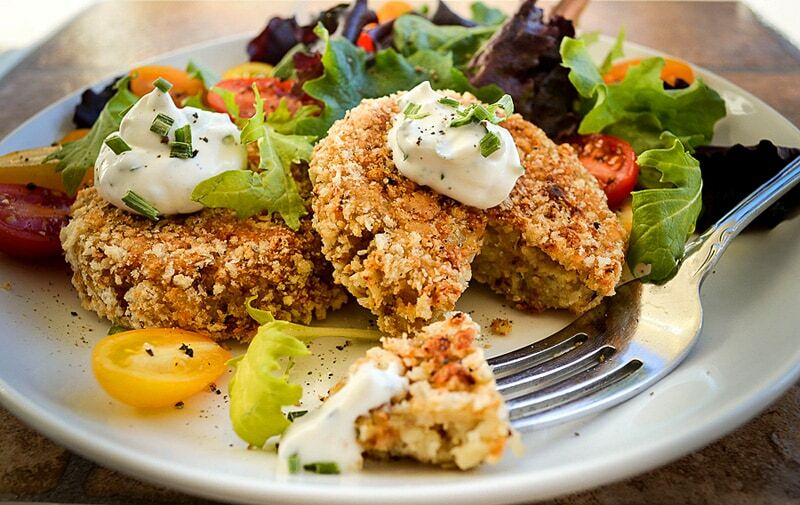 These crispy little Cauliflower Cakes with Sour Cream Herb Sauce can be made either vegetarian or vegan. There are a few companies now making vegan sour creams that are so close to the original, many non-vegans wouldn’t be able to tell the difference! At the time of writing the original recipe, I used silken tofu as a binder. While it made for an amazing texture (see the batter photo below), I realize there are so many other options available. One vegan option I like to use in savory dishes such as this are 1 Tbl of ground Flax Seeds mixed with 3 Tbl of Water. Allow to sit and it will become gelatinous much as an egg would. Preheat oven to 400 degrees. Cut the cauliflower into florets. Peel and cut the shallots into two pieces each. Peel and cut the potatos into large cubes. 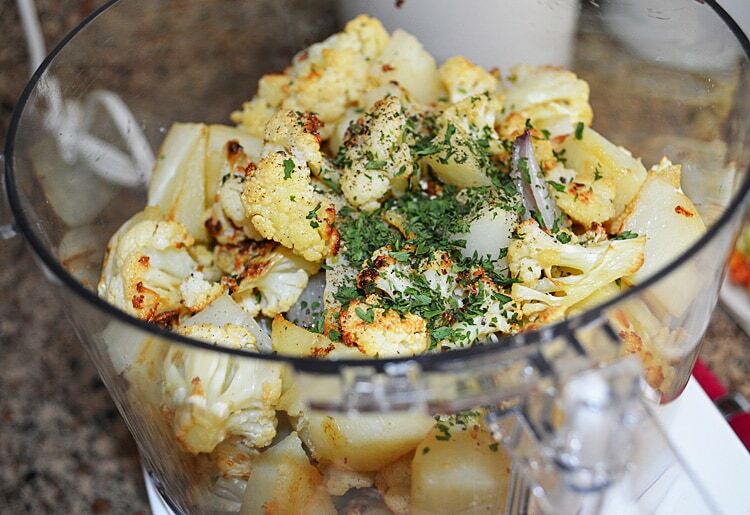 Place the cauliflower, shallots and potatoes on a baking sheet and drizzle with vegetable oil. Toss lightly. 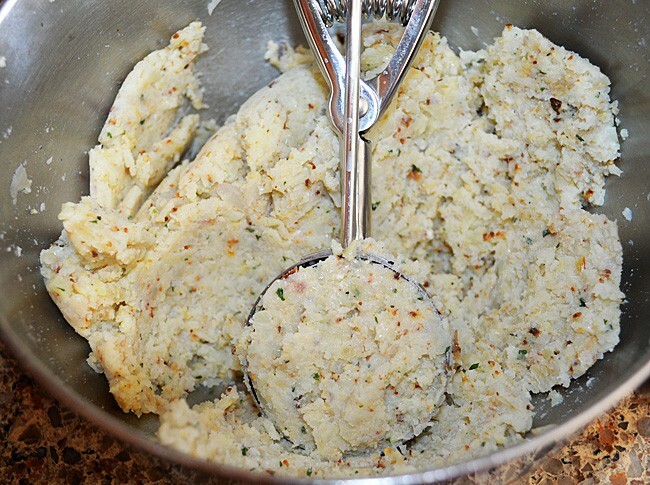 Bake for 35-40 minutes or until potatoes are tender. You may need to remove the shallots prior to the end of the overall baking time if the potatos take longer. Place the mixture, along with the tofu, quinoa, salt, pepper and parsley into a food processor and pulse until chopped. In another small bowl, combine the Panko bread crumbs and the parmesan cheese. In a third small bowl, place the almond milk. 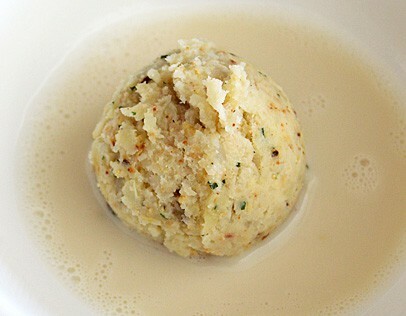 Using an ice cream scoop, scoop the cauliflower mixture and place into the almond milk to coat. Remove and place in the bread crumb mixture. 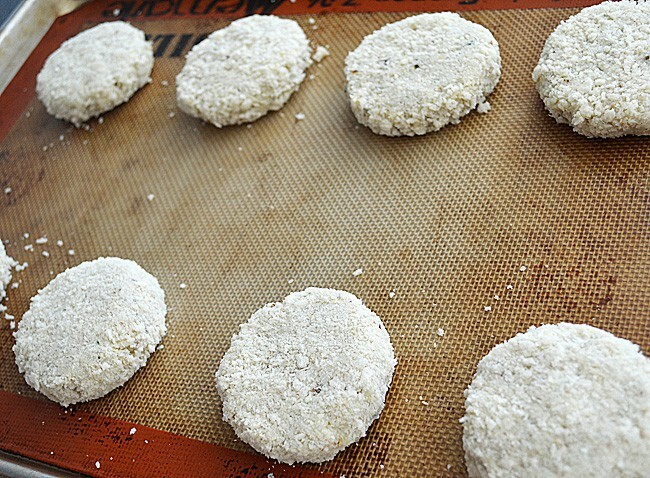 Shape into a patty and place on a lined cookie sheet. Continue until all 8 patties are made. In the same 400 degree oven you roasted the cauliflower in, bake the patties for 30 minutes, flipping only once. They should be lightly golden and hold together nicely. To prepare the sauce, mix together the sour cream, vegenaise (or mayonnaise if vegetarian), parsley, chives and pepper. 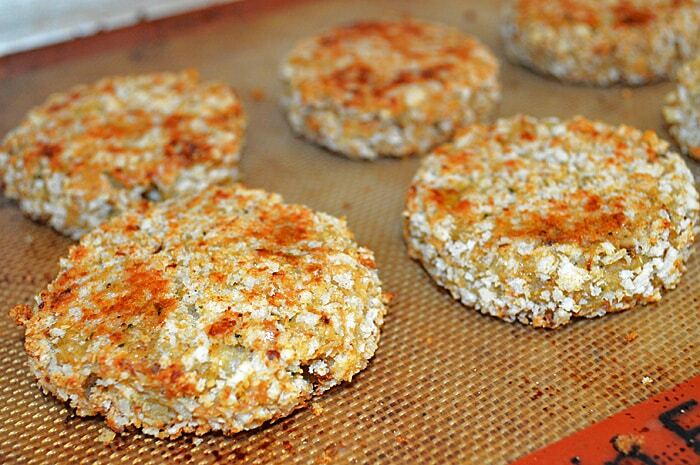 I really love this particular sauce with these cauliflower cakes. 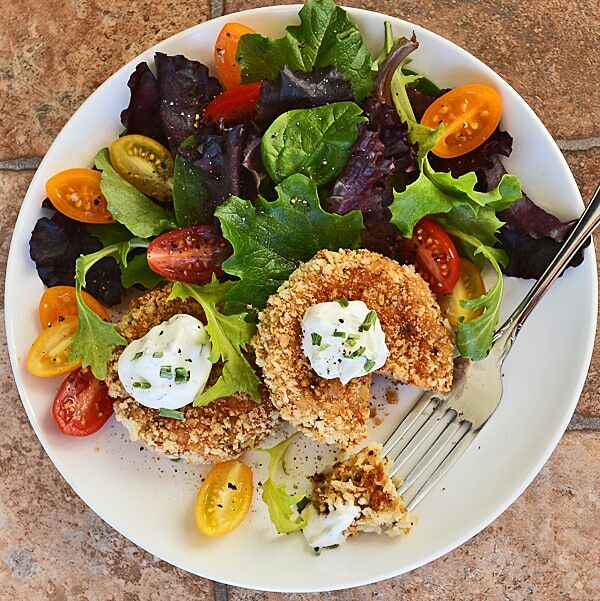 Serve the cauliflower cakes with a salad of mixed greens, tomatoes and a light vinaigrette of olive and vinegar. Season with a bit of salt and pepper, to taste. Cut the cauliflower into florets. Peel and cut the shallots into two pieces each. Peel and cut the potatos into large cubes. 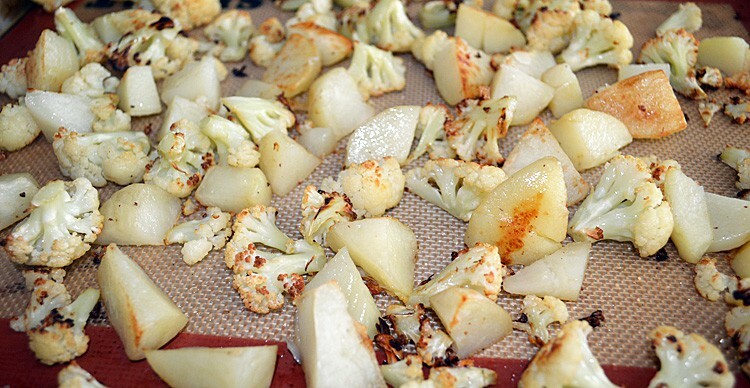 Place the cauliflower, shallots and potatos on a baking sheet and drizzle with vegetable oil. Toss lightly. Bake for 35-40 minutes or until potatos are tender. In the same 400 degree oven, bake the patties for 30 minutes, flipping only once. They should be lightly golden and hold together. 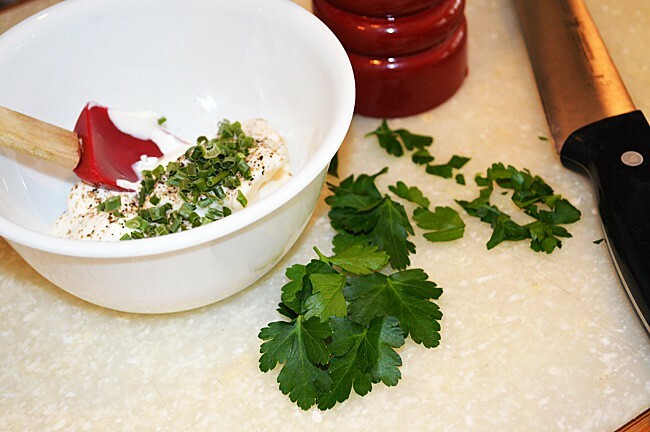 To prepare the sauce, mix together the sour cream, vegenaise, parsley, chives and pepper. 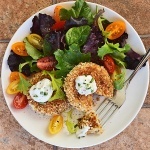 Serve the cauliflower cakes with a salad of mixed greens, tomatos and a light vinaigrette. What did you do with the ¼ C Cooked Quinoa? Did miss that part? Hello! I did not eat cauliflower before but now I’ve enjoyed it a lot, and this recipe seems to be delicious, and I’m going to try it very soon. Can I omit the tofu or substitute it? would it work without the tofu? trying to avoid soy. Thanks! Would these freeze or at least reheat well out of the fridge? These look delicious!!!! Thanks for the recipe.